A giant solar flare, an X4.9-class sun storm, erupts from the sun at 00:49 GMT on Tuesday, Feb. 25 (7:49 p.m. Monday, Feb. 24 EST). This image of the flare was captured by NASA's sun-watching Solar Dynamics Observatory. The sun fired off a major solar flare late Monday (Feb. 24), making it the most powerful sun eruption of the year so far and one of the strongest in recent years. 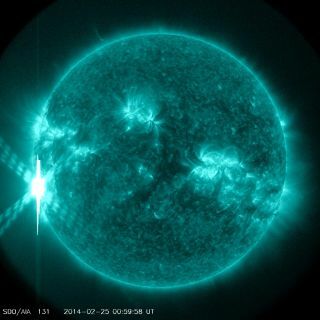 The massive X4.9-class solar flare erupted from an active sunspot, called AR1990, at 7:49 p.m. EST (0049 Feb. 25 GMT). NASA's Solar Dynamics Observatory captured high-definition video of the monster solar flare. The spaceecraft recording amazing views the solar flare erupting with a giant burst of plasma, called a coronal mass ejection, or CME. "Long-lived sunspot AR1967 returned to the Earthside of the sun on Feb. 25th and promptly erupted, producing an X4.9-class solar flare," astronomer Tony Phillips wrote in a Spaceweather.com alert. "This is the strongest flare of the year so far and one of the strongest of the current solar cycle." Earth isn't totally out of the woods yet, however. This region of the sun is set to rotate more fully into view of Earth over the next week, according to officials with the NOAA-led Space Weather Prediction Center. X-class solar flares are the most powerful kinds of solar storms. If directed at Earth, last night's solar flare could have caused a serious geomagnetic storm, created when charged particles slam into the planet's magnetic field. When aimed at Earth, strong solar flares can harm satellites and astronauts in orbit around Earth. A powerful solar flare delayed the launch of a private cargo ship to the International Space Station in January. A massive X4.9 solar flare erupts from a long-lived sunspot on the sun at 00:49 GMT on Tuesday, Feb. 25 (7:49 p.m. Monday, Feb. 24 EST) in this view from one of many light wavelength observations by NASA's Solar Dynamics Observatory. "Radio emissions from shock waves at the leading edge of the CME suggest an expansion velocity near 2,000 km/s or 4.4 million mph," Phillips wrote. "If such a fast-moving cloud did strike Earth, the resulting geomagnetic storms could be severe." The sun is currently in the active phase of its 11-year solar cycle, called Solar Cycle 24. While X-class storms are the most powerful, mid-level flares are named M-class events, which can supercharge Earth's northern lights. Weaker C-class events round out the top three most powerful types of solar storms. Editor's note: This story was updated to reflect a correction at 10:12 a.m. EST. The flare occurred on Monday, not Tuesday, as previously stated.